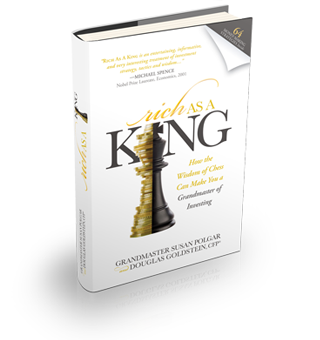 In an innovative new book, Grandmaster Susan Polgar has teamed up with renowned financial advisor Douglas Goldstein, CFP® to apply the thinking used for winning on the chessboard to making smart investment decisions. Rich As A King uses chess techniques to explain the do’s and don’ts of successful investing and money management, explaining such concepts as investor confidence, goal setting, the function of insurance, risk tolerance, and more. Rich As A King is a must-read for anyone interested in Polgar’s chess career, as it is illustrated with some of her classic chess moves. It describes the strategies she used to beat famous world champion Vasily Smyslov in 1993, and Xie Jun in 1996 in great detail. Bonus material: Readers of Rich As A King get access to 36 never-before-seen videos of Susan Polgar teaching chess ideas (see sample: www.RichAsAKing.com/demo-video).